In the course Porosity and Surface Area Characterization the overall basic principles and definitions of porosity, density, pore size distributions and specific surface area of solid materials are discussed. In addition, also the characterization of different types of active sites (e.g. catalysts) and their surface area are discussed. Pros and cons of the techniques are highlighted and common pitfalls in porosity and surface area characterization are interactively discussed. Accuracy, quality and quality control are separate topics that are dealt with together with selection of appropriate measurement techniques. A fully-equipped laboratory is located in the same premises as where the course is taught, which enables a perfect blend between theory and practice. This course is in close relation to the course Particle Size Characterization. Both courses are scheduled together in order to enable attendance of both courses in a series of 3 days. The central theme addressed in this course is how to define and characterize porosity, surface area, crystallite size and active surface area and density of particles. 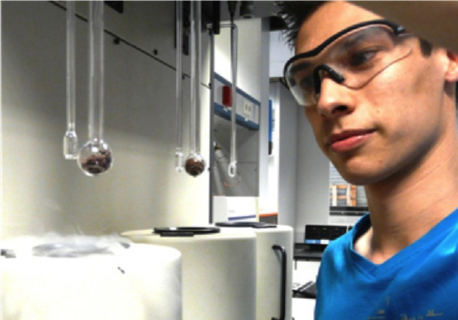 The course is organized by and at the premises of Delft Solids Solutions, where also a fully equipped laboratory is available. In this laboratory the most important techniques in the area of poristy and surface area characterization including sampling and sample pre-treatment equipment is available. The course consists of one successive day of 8 hours. After attending this course you will have a good overview of the available techniques for porosity and surface area characterization. You know the underlying principles of the various methods, as well as the reliability of the measurement results. You know how to perform sampling and how to interpret the results and judge the quality of it. The investment in this 1-day course amounts to € 875,- ex. VAT. In combination with the course Particle Size Characterization (3 successive days in total) the overall investment is € 1.995,- ex. VAT. This course is held at the premises of Delft Solids Solutions, Molenweer 2B, 2291 NR Wateringen, The Netherlands. The next course will be held on Friday November 16th, 2018.